On Wednesday, the NCAA announced that it would penalize former Tennessee men's basketball coach Bruce Pearl with a three-year show-cause penalty. The decision, which effectively shuts him out of a college coaching job for three years, is a result of infractions Pearl committed during his tenure at UT, which included impermissible contact with a recruit at a barbecue at his house in September 2008. 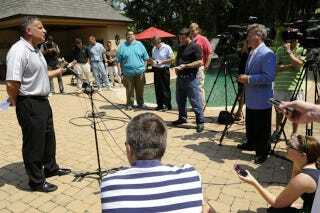 Yesterday, Pearl addressed the media—during a barbecue at his house. During the poolside press luncheon, Pearl addressed his future in coaching and his feelings toward the NCAA system. He admitted that he "misled" NCAA investigators about a photograph taken of him and then-recruit Aaron Craft at his September 2008 barbecue. "I was in control of that situation, and I didn't handle things right at my house," Pearl told the members of the press who had gathered at the same house. "Had I been more forthcoming in my interview with the NCAA, we wouldn't be here." So we're clear: He means here, at a barbecue at his house, addressing his punishment for a barbecue that he once hosted at his house. "If given the opportunity, I hope to be able to assist the NCAA in trying to make the process better," Pearl said. "One of the ways I'm going to serve is by serving as an example." But, Pearl added, the process of going through an NCAA investigation, hearing and penalty phase "takes too long," and, he added, "the rulebook is too big." Pearl also said there aren't any guidelines for penalties and not enough levels/classifications of violations. There is, for example, no hot dog clause. But like Eamonn Brennan over at ESPN, we have to wonder about Pearl's intension here: was it "gallows humor," an "unintentional coincidence," or "a simple overwhelming preference for barbecue?" Real estate broker Debbie Elliot-Sexton, who is overseeing the sale of Pearl's $2.69 million house, provides another possibility. "It is," she told the News Sentinel earlier this month, "just fabulous for entertaining." Photo by Amy Smotherman Burgess.